The Department of Education (DepEd) officially released results of the 2015-2016 Alternative Learning System Accreditation and Equivalency exam (ALS-A&E) on Wednesday, June 29, 2016. The alphabetical list of passers for elementary and secondary are available on this page as announced online. The ALS A&E Test, formerly known as the Non-formal Education A&E Test, is a paper and pencil test designed to measure the competencies of those who have neither attended nor finished elementary or secondary education in the formal school system. Examinations were administered in 17 regions nationwide by the Bureau of Alternative Learning System (BALS) of DepEd on April 17, 2016 for wave 1 of exam (Regions I, II, III, IV-A, IV-B, V, NCR, and CAR) and April 24 for second wave of exam (Regions VI, VII, VIII, IX, X, XI, XII, Caraga, and ARMM). Tests for the extension centers such as rehabilitation, formation centers and BJMPs were conducted on April 16 and 23. The April 2016 ALS A&E results are expected to be released in July to August 2016 (3 to 4 months after the exam). In 2014, a total of 84,785 successfully hurdled the exam nationwide. 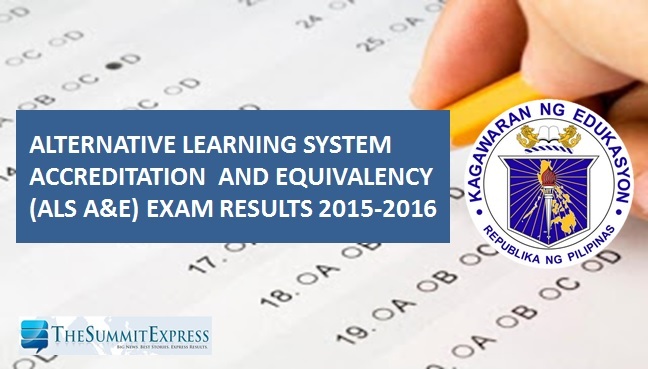 Results were announced in May 2015 or four months after the last day of scheduled examinations. The A&E registration, administration, and certification are provided free by DepEd. Passers of the ALS exam are given a certificate or diploma, signed by the DepEd secretary, certifying the passers’ competency as comparable to the graduates of the formal school system. Passers are qualified to enroll in secondary and post-secondary schools. Targets of the ALS are school drop-outs, those who have not attended the formal school system, homeschoolers, or others who have not finished basic education but are basically literate.